This Space Alert review was made after playing the game 20+ times. 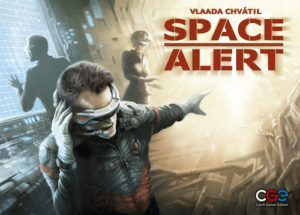 Designed by the brilliant Vlaada Chvátil (Mage Knight, Through the Ages) back in 2008, Space Alert allows players to take on the roles of space explorers as they collect information in a very dangerous part of space. As the players move through the game, they will have to devise different ways to protect their ship from outside threats in order to win the game. 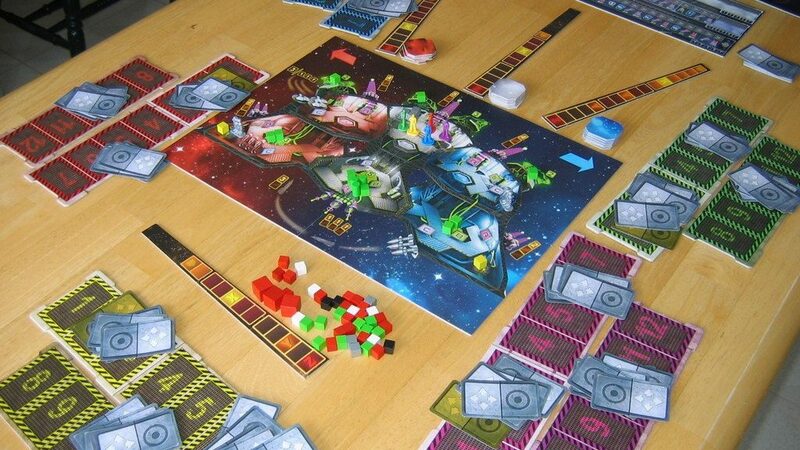 Since its release, Space Alert has been quite successful, winning the New Game Worlds prize at the 2009 Spiel des Jahres awards. In Space Alert, players get to decide on a mission from the CD/MP3. Each mission is separated into two rounds: the action round and the resolution round. The action round is when the computer announces threats as they appear and the players use their cards to try to deal with those threats. Most of the cards have actions and movements attached to them, which will be used in the resolution phase. Players can work together during the action phase to decide where they are going to move, what they are going to do, and they can also help each other. During the action rounds, the Space Alert MP3 will announce when incoming threats are arriving. Players then adjust their plans accordingly in hopes of stopping those threats.The explorers have 10 minutes to go through the three phases of the mission. Once the action round is completed, the resolution round is played and the players see if their actions helped them survive the mission. There is a full Space Alert tutorial that comes in the box, so even though it might be a bit confusing at first, going through a practice game will definitely clear some things up. It helped us! The theme of Space Alert is essentially playing as if you were on the Star Trek Enterprise, which is awesome! It’s almost impossible not to get into this theme, especially if you’re a fan of one or more of the many TV shows and movies that take place on spaceships. One of the most impressive things to me is that this feels like a long, deep game yet most games take less than 30 minutes. Space Alert is very hard to beat, which is always a great thing for my group. It’s definitely not impossible to win, but you will probably end up with a pretty high losing percentage. Still, even the losses are fun! It is going to be tough for anyone to be an alpha player in this one since everyone is working at the same time. This definitely makes it a better co-op experience for us. While we were initially worried that the Space Alert MP3 would take away from the experience, it actually just adds to the theme. It also allows every player to work simultaneously rather than having one player reading out instructions. Space Alert can be a bit chaotic, which can make it hard to follow for some players. This probably isn’t a great game to play with people who are new to the hobby since there are a lot of moving parts and it’s hard to teach it on the fly. The learning curve is a bit steeper than the typical real-time cooperative game, though the rules aren’t too difficult to grasp after playing through the tutorials. The game certainly isn’t ugly, but I’m really not a fan of most of the cardboard in the box. The main board is okay, but a lot of it reminds me of the newest edition of Robo Rally, which I find to be super-unattractive. This game was definitely made to be played with four or five players. It’s okay at three, but you really want to have as many of the roles filled as you can so you don’t have to worry about controlling the android/dummy player. Though not at the top of our favorite real-time games list, Space Alert is a very good game for anyone who loves intense science fiction conflict. Once everyone gets the basic rules and knows how to communicate, it can be a lot of fun being in control of this ship and taking out some aliens! It is definitely one of the best co-op space games we’ve played so far because the theme is well implemented, it requires good teamwork, and it’s challenging. If you end up enjoying the base game, definitely take a look at the Space Alert expansion, Space Alert: The New Frontier. Thanks for taking the time to read our Space Alert review! To stay updated on all things cooperative board games, follow us on Twitter, Facebook, or via RSS.